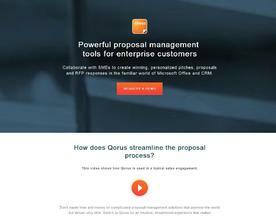 Online Proposal Management Software exists to make managing and creating business proposals as fast and easy as possible, with apps that can help to make managing and delivering proposals straightforward and rewarding. Proposal management software usually contains features to enable creation and tracking of digital or interactive proposals as well as the more traditional forms of proposals. The Proposal Management Software here is offered under the SaaS (Software as a Service) model, meaning that the software is web based, hosted on the Cloud and can be accessed when needed through a client or web browser. If you’re looking for similar online software like Proposal Management Software, consider our Lead Management or Sales Forecasting Software categories.